As I'm sure most of you already know, I said YES to the dress! (not the one pictured of course!) It was so much fun having my mother and two of my friends with me to help me find the perfect dress for our wedding day. Wedding dress shopping has by far been my favorite part of this wedding planning process so far! I'm going to be honest though and say leading up to my dress appointments, I was SO nervous. I am such an indecisive person, so the thought of having to choose a wedding dress kinda freaked me out. I didn't want to pick something and then a few months later decide I didn't like it, or not be able to find anything I loved in general! I think there was this huge pressure and build up to wedding dress shopping that I just got overwhelmed. Fast forward to arriving at my first appointment and slipping into my very first wedding dress try-on ever and oh my goodness it was seriously the funnest thing ever. Trying on wedding dresses is so unexplainably magical and for me was the moment that I went, "oh my gosh, I'm getting MARRIED!". It was so surreal. After I posted on Instagram that I said yes to the dress, I received so many messages wanting to know how I knew it was "the one". I know everyone tells you that you will just know and it sounds cliche, but it's so true. But, to give you all a little more guidance on choosing the perfect dress, I shared some tips below! 1. Bring a small, limited group with you. I brought my mother and two friends to my appointments which was the perfect amount for me. Of course you want the opinions of other people (I know I did! ), but at the end of the day, the dress you choose should be the one you personally love. Having too many differing opinions being offered up will only overwhelm and confuse you. 2. Try on more than one dress. The very first wedding dress I tried on, I honestly thought it was the one. I felt so beautiful in it and fell head over heals in love with it even though it was missing some things on my "checklist". I had another dress appointment right after and considered cancelling it but decided to go to it anyways, even though I was almost certain that I would end up choosing my first dress. I am SO happy I went to my other appointment because I ended up choosing a dress there! I realized that, while the first dress was beautiful, I was more excited about it because it was my first time trying on wedding dresses. The excitement came from the overall experience of wedding dress shopping, not from it being "the one". Hope that makes sense! 3. Only look at dresses within your budget. I only tried on and looked at dresses that fell within my budget. Reason being is that I didn't want to try on something completely out of my price range, fall in love with it, and then not be able to buy it. Also make sure that your appointment host/employee knows that you are wanting to stay within your budget. 4. Come to your appointment with an idea of what you want. Having a general idea of the kind of dress you want will help narrow down your choices and make it easier to decide! 5. Limit how many dresses you try on! I tried on around 12 dresses, which felt like a ton and I started to get overwhelmed/confused towards the end. Being so indecisive, I wanted to make sure I tried on all my options before choosing but that just made the decision ever more difficult and the dresses started to blur together. 6. Don't rush! Take your time with each dress when trying it on. Walk around in it, dance in it, or whatever! Just make sure you really get a feel for it before moving on. 7. Take photos of you wearing each dress. I couldn't recommend this enough, especially if you are a visual person like me. I had my friend take photos of the front and back of every dress I tried on and then I would sit down and scroll through the images to see what I liked best on me. It's also so fun having those photo to look back on so I can remember the experience! 8. Consider getting your bridal makeup done before your appointments. This is what I did and I was soooo happy I did! Having my makeup look similar to what it will be the day of our wedding helped me visualize the complete look so much more. Plus it was just really fun getting all dolled up for the day! 9. Watch for the reaction of your friends and family. Seeing my mom and friends faces light up when they saw me trying on the dress I chose helped make my decision so much easier! Watching my mom get emotional when I said yes the the dress was beyond special and a moment I will cherish forever. 10. Realize that no matter what dress you choose, you are going to look absolutely beautiful on your wedding day. Wedding dresses are absolutely stunning, so odds are most of them are going to look incredible on you! On your wedding day, you are going to be wearing a beautiful dress and not a single person there is going to be comparing your dress to other dresses you tried on. 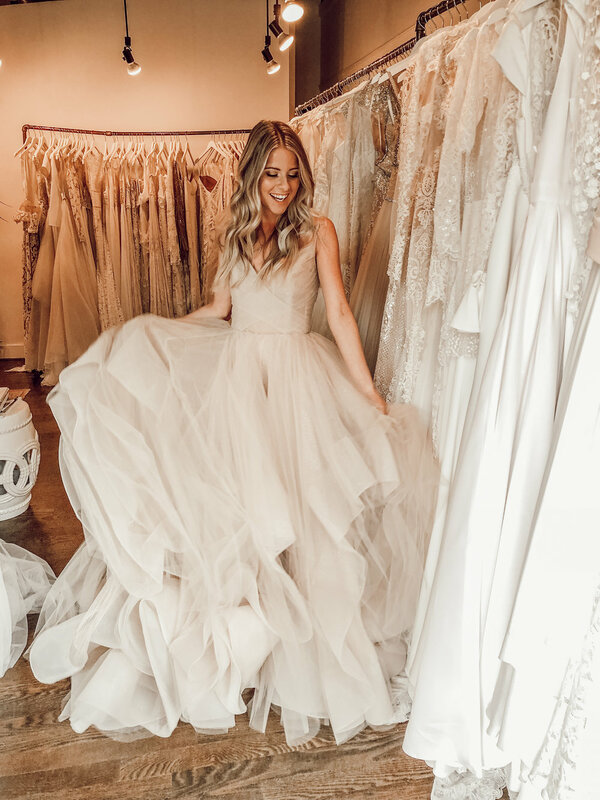 While choosing "the one" is a big deal, your wedding day is going to be absolutely magical no matter what dress you are wearing. I hope all these tips help you bride-to-be's out! If you have any other questions please don't hesitate to ask me! (: And congrats!! Being engaged is seriously such an exciting stage of life - soak up every minute of it!